Julien, a Master Baker in artisan breads and pastries, came to Halifax from France on a six-month contract in 1984 and never left. Didier Julien and his wife Laura Mulrooney opened the first location of Julien’s Patisserie, Bakery & Café in Chester. Expansion began in 1992 when Julien’s started selling at the Halifax Brewery Market, and shortly thereafter the Halifax location in the Hydrostone Market was opened. Julien’s menu includes artisan breads and traditional French pastries, from a sourdough made using local beer to canelés, a pastry that originated in Bordeaux and quickly became a favourite among their customers. Julien’s has stayed away from gluten-free products, but Didier has developed his own kamut and spelt recipes. For over twenty years our customers have been putting fresh bread and croissants on their table, delivered daily from Julien's bakery in Chester. 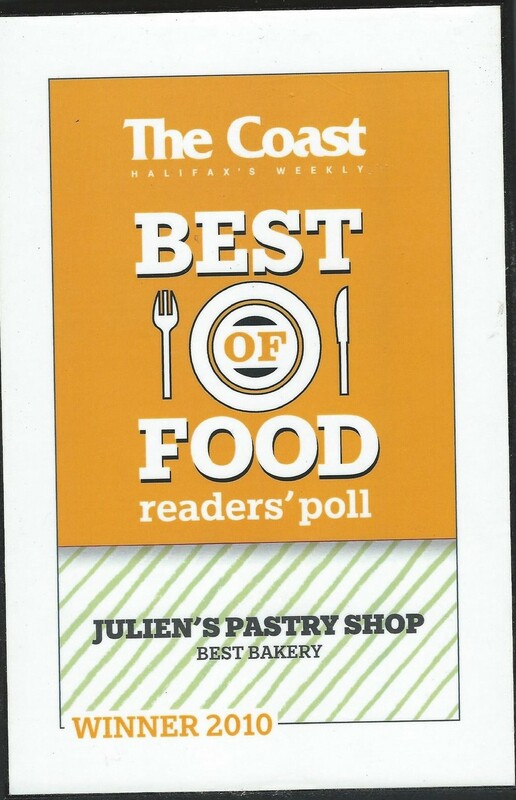 Since 2003 Julien's bread has been recognized as the best in Halifax by The Coast's annual Best of Halifax Food award. Lana Ansari is the owner-operator of Julien's Patisserie and Cafe, where our customers can buy fresh baked bread or enjoy a wide range of teas, and locally roasted Java Blend coffee, together with delicious pastries and other treats. Lana Ansari with other team members. You are welcome at Julien's Patisserie and Cafe where we are always delighted to see you.